I took Ramona to her first protest when she was three months old. It was the TUC march against the cuts and she managed to sleep her way through most of it; brass band, fireworks, whistles and chanting were mere fleas to be flicked off her giant love of snoozing. She sleeps now as I gather together the things we will need for today, her second ever protest. Snacks, marker pens for bespoke placards and bunting. Occupy London here we come! Today we get the opportunity to march against greed. “You can’t protest greed!” someone Facebooked this week during a little chat about Occupy Wall Street on his wall – try telling that to Gandhi and his salt marchers. Greed is the source of many of the world’s issues past, and for this present one we are talking about Corporate, Global, Policy-supported Greed. The kind of Greed that in a not-that-roundabout way has us (the less-greedy or the 99%) tangled up in joblessness, homelessness and even extreme hunger. Someone needs to start building a path out of this situation and the Banks and Corporates don’t have the morals and Osbourne and Cameron don’t have the balls. 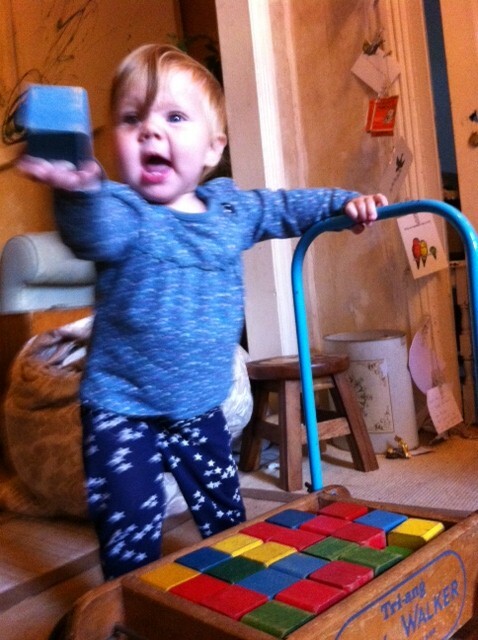 I think the world stands a better chance with Ramona and her blocks frankly. Posted in Parenting and tagged occupy, occupy london, robin hood tax, wall street. Bookmark the permalink.